What came first, Donald Trump or his supporters? If some in the #NeverTrump movement are to be believed, it doesn’t matter -- they’re one and the same. We’ve reached the end of the dog days of August, a time when the party conventions concluded over a month ago and there isn’t a whole lot new to complain about for the #NeverTrumpers, so they’re digging deep to try and keep their point of view from being swamped by Crooked Hillary’s latest scandal or Donald Trump’s most recent tweet that draws a headline. Such was the case in Trump’s handling of the news from Chicago over the weekend, when the Republican nominee impulsively tweeted a rather poorly thought out message regarding the tragic death of NBA basketball star Dwyane Wade’s cousin, whereby he suggested the killing would inspire African-Americans to vote for him. You can only imagine maybe Steve Bannon and/or Kellyanne Conway suggested to Trump that he might have messed up, hence the second tweet. Okay, looking at it from the outside, Trump didn’t handle the situation very well. It kind of reminded me of his immediate reaction to the Orlando massacre in June committed by a radical Muslim terrorist, where he basically almost took credit for “predicting” the event. But Trump is Trump. He tweets for effect. The reaction to his words from #NeverTrump went way over-the-top, however. And some of them are no longer restricting themselves to bashing Trump, they’re taking off after his supporters, too. Hmmm. This is the exact opposite of my experience with people who back Trump – at least the ones who do so openly. As I’ve said a lot lately, many of those I talk with who are conservative and support Trump are reluctant to say it publicly because they fear a backlash from the hopelessly “I’m With Her” gaggle of politically correct rubberstampers – or from the #NeverTrump crowd itself. So if a losing Trump is more dangerous than a winning Trump, shouldn’t they be joining him? But I think Taylor’s right on one thing – Trump will do everything in his power to call into question Hillary’s election, and yes, his supporters will be right there with him. Unlike in the primaries when Trump’s complaints about a “rigged” Republican nominating system weren’t supported by any evidence, there’s a lot of proof that the current electoral system is fixed by those in power. And as amply demonstrated by the good folks at Project Veritas, committing fraud is about as easy as walking into a polling place that doesn’t require ID and asking for a resident’s ballot. Election fraud is being perpetrated in Nevada as well, as demonstrated by another Project Veritas video. This time, Hillary Clinton’s own campaign staff is helping to commit the fraud and violate the law at the same time. It’s shameless – almost as bad as people like Taylor who write for so-called “conservative” publications claiming that the system isn’t rigged. But perhaps more disturbing than Taylor’s ignorance of the vast potential for election fraud is his classification of all Trump supporters as misogynists and racists just because they might defend their candidate from his own incendiary characterizations of the nominee. 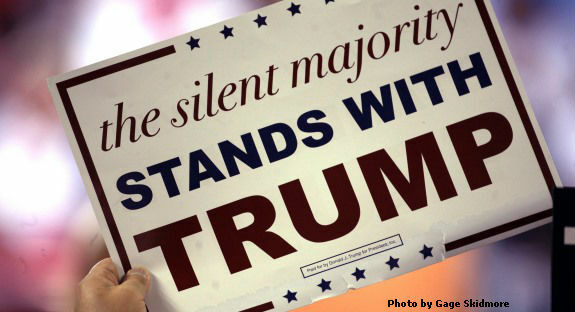 Simply put, you can still support a candidate and not like everything he says – or tweets. I think most of Trump’s staunchest backers would question the taste if not the wisdom of his saying people will vote for him because a relative of someone famous was tragically killed in Obama’s hometown. That’s not a very wise thing to say. But it also doesn’t force me to conclude Trump is now a worse choice than Hillary in this election either. And it doesn’t prove I’m a racist because I’m #NeverHillary. I think Trump is learning quickly that Twitter is a weapon that should be used carefully – or at least that he probably should run the content of these tweets by someone before sending them…someone whose “filter” might be able to pick up a problematic utterance before it gets out there to tick off the overly-sensitive. But I guess Trump’s spur of the moment tweets do give someone like Taylor something to write about. Full employment for #NeverTrumpers, right? After reading the non-stop barrage of negativity from the #NeverTrump crowd day after day, it’s refreshing to be able to talk about the reasons why Trump might win instead of constantly trying to debunk the reasons why he’ll lose. There’s still a long way to go until the election, so there’s plenty of time to hash over the polls and other data, which all seem to favor Crooked Hillary at present even if you’re personally hard pressed to find someone who actually wants her to be president. With that in mind, here’s one person who’s betting on Trump. Heather R. Higgins (president and CEO of Independent Women’s Voice) writes in National Review, “Trump’s voters (and many are staying mum) are well aware of his flaws and might carry him to victory anyway. 1) It feels a whole lot like Reagan in ’80 and Newt in ’94. 2) Who are you going to believe, polls or your lying eyes? 3) If what got incinerated was a phoenix, don’t bet against it rising. 4) Enter the stages of grief. Obviously it’s not possible to thoroughly examine all of Higgins’ reasons here, but I think she makes some excellent points. There are certainly a lot of parallels between Trump and Reagan even if their temperaments are completely different and Reagan never had access to a Twitter account. Point #2 is particularly interesting as it includes some of Higgins’ own anecdotal evidence that Trump will pull it out in November. In talking with people over the months from all different races, religions and genders, she’s found some common themes – namely, that Trump will benefit from the fact he’s not Hillary and he’s from outside the deeply distrusted political system. This is the chief reason Trump won the Republican nomination in my estimation, because a lot of good folks felt a Washington insider couldn’t get the job done. In this sense, Trump’s lack of a political record very much worked in his favor. Once he gets in office, he’ll have to fight the temptation to get too close to the establishment of both parties in order to truly accomplish anything. But he has to get elected first – and that will be up to the people. Higgins thinks as the days draw closer to November 8 that folks will see the choices at hand and get scared to death of the prospect of a Hillary Clinton presidency. I agree…by that measure, Donald Trump is looking pretty good. Conservative leader Richard Viguerie has a saying, “Tell me who you walk with and I'll tell you who you are.” Viguerie uses the philosophy in assessing conservative candidates – he reasons if you surround yourself with conservatives, chances are you’ll govern as a conservative. Needless to say, the philosophy also applies at the other end of the spectrum, and judging by the people Hillary Clinton “walks with,” we’re going to get a lot of scary characters very close to power if she ever ends up sitting behind the desk in the Oval Office. Clinton’s closest aide Huma Abedin announced on Monday that she’s separating from disgraced pervert internet sexting expert and former Congressman Anthony Weiner. What a classy guy. It sounds like Wiener’s taking full advantage of modern communications technology to keep in touch. I’m guessing Hillary knows him well too, since she and Huma are such good buds. Of course in addition to being married to a man like Wiener, Abedin has close family ties to the Muslim Brotherhood. So not only is the information surrounding Crooked Hillary subject to being handed over to terrorist organizations (and we’re not even talking about the email server here), it was just one whisper away from being overheard by a known scumbag like Wiener too. Once again, who you walk with reveals a lot about who you are. Can you imagine if a member of Donald Trump’s inner circle was involved with this type of thing? The media frenzy would be unrelenting. It will be interesting to see in the coming days just how far the media goes in defending Abedin and through extension, Crooked Hillary. The old saying goes you can choose your friends, but you can’t choose your family. Well, Abedin chose to marry Wiener and stick with him through years of proven perversion. And Hillary chose to keep Abedin around when all of this has been out in the open (including her relational connection to the Muslim Brotherhood). It’s yet another instance where the Clintons believe they are above the law – and above public reproach. Who you walk with tells us a lot about who you are. That makes Crooked Hillary a shady character, indeed. Finally today, it’s no secret that Donald Trump is now actively seeking minority votes this election. On Monday, for example, he promised to “stop the slaughter” in black communities if he is elected. Like his Chicago tweet above, perhaps not the most delicate way to put it, but as usual Trump’s words were direct and to the point. And he forced the media to cover it, didn’t he? When he said he would campaign in the inner cities, he meant it. Nick Gass of Politico reports, “Continuing efforts to reach out to black voters who have largely avoided supporting Donald Trump to this point, the Republican nominee's campaign announced that he will visit Detroit on Saturday to speak to the president and CEO of the only African-American-owned and -operated national Christian television network. Trump’s outreach to the minority communities is much overdue for Republicans who have all but ceded the inner cities to the Democrats since the Great Depression. With the party doing horribly with minority voters and demographics moving rapidly away from them, the GOP really has no choice but to make this kind of appeal. When Trump says “what do you have to lose?” to inner city residents, he’s only speaking the truth. What could they possibly expect to change if Hillary wins in November? Government policies can only go so far to boost the fortunes of people who truly want to work and better themselves. But as amply demonstrated by the decades of Democrat control of America’s cities, government policies can foster failure too. I think Trump’s outreach will ultimately succeed in bringing larger percentages of minorities to the Republican Party. The question is whether it will be in time to help him this year.